Our company has much experience in commerical works, carrying out work for the outdoor areas of local shops, schools and council owned areas within Surrey. With large areas, trees can become a problem and it is common for the land owner to require the services of a knowledgeable tree surgeon whether it be on a one off basis or contractual terms. Whats more, if a commercial outdoor area required ongoing work, we can draw out a contract to ensure we are available as and when you need us. We cover most of Surrey, including areas such as Guildford. A contract will often be needed for longer term projects. For instance, if you have a lot of trees the likelyhood is they will need ongoing maintenance, whether this be monitoring the growth or removing branches that become out of control. With ongoing advice you can ensure that as a commercial property owner, you stay within the law when it comes to your trees. Although you may inherit trees or surrounding plants and hedges, it is your responsibility as the land owner to ensure they meet safety regulations. Even in situations like storms or bad weather that effects trees, these still become the responsibility of the land owner, meaning that it will always be handy to have the number of a local arborist to hand. We can provide a commercial property with a wide range of services, including tree felling, hedge cutting, garden clearance and removal of plantation or shrubbery. 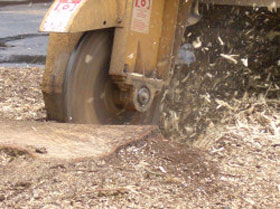 We also provide tree stumps removal, a popular service amongst thoose inherting commercial lands. Since redudant tree stumps are a health and safety risk, it is important to remove these before allowing access to the public. The service is commonly called upon in schools, pubs and country parks.